"Seabed Explorations: a network of individuals, dedicated to the discovery, excavation, conservation and exhibition of shipwrecks and artifacts of archeological significance..."
Seabed Explorations is comprised of a network of individuals and companies, managed by Tilman Walterfang, who are dedicated to the discovery, excavation, conservation and exhibition of shipwrecks and artifacts of archeological significance which, at some time in history, have been lost to the oceans of the world. 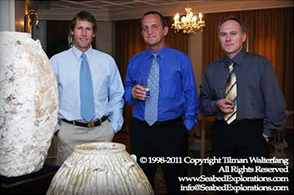 Seabed Explorations is an environmentally conscientious commercial enterprise which employs a core team of specialists, distinguished scholars, undersea archeologists as well as conservation experts who all work together to assist with the care, management and authentication of finds discovered during our projects. While striving to be the very best in our business, we recognize the profound responsibility that comes with the management of relics and artifacts that can unlock the secrets of ancient civilizations. We are fully committed to the conservation of the world’s heritage for the enjoyment and cultural enrichment of both present and future generations. 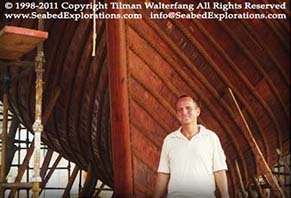 Image above: Tilman Walterfang, founder and owner of Seabed Explorations N.Z. Ltd., heading out to sea in Indonesia- on a preliminary reconnaissance dive; investigating a World War II shipwreck potentially consisting of a large collection of Asian antiquities. With its hard-won experience and extensive knowledge-base, Seabed Explorations retains the skilled personnel, collective assets and technical resources required to assess the practical and economic feasibility of potential salvage scenarios. Our network of experts maintain a presence in numerous countries and maritime domains; and collectively represent hundreds of years of combined experience and accumulative knowledge in the field of maritime archaeology, hydrographic survey and research. We've set the benchmark and raised-the-bar internationally for privately financed quality-controlled, preservation and conservation operations that address the ethical management of Underwater Cultural Heritage derived from ancient shipwrecks. Presently, there is a growing understanding that organizations like Seabed Explorations are perfectly positioned to carry out responsible and professional recovery operations, while respecting historically significant wrecks and their precious cargoes; hence quite frequently, local communities and governmental authorities are bringing such shipwrecks and their treasures to our attention. 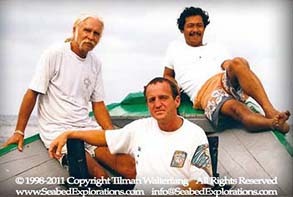 Tilman Walterfang, founder and owner of Seabed Explorations NZ Ltd. with friends while anchored over the now-famous Tang Treasure (Belitung) shipwreck site in Indonesia. Together with Tokutaro Unosawa (blue dive suit)… By trade a professional Maritime Architect who pioneered scuba diving in Japan and the director of the Singapore based maritime exploration company "Singapore Ocean Dream Pte. Ltd. [Japan]." Unosawa (deceased) was the acting logistics manager for Seabed Explorations Group after the Belitung Shipwreck recovery. In hat and sunglasses: Mr. Tsuguhiko Kadokawa (chairman/CEO of Kadokawa Shoten Japan). Seabed Explorations determines whether a shipwreck site or archeologically significant cargo has already been partially salvaged (or looted) or damaged by other forms of human interference and analyses the maritime conditions that might constrain or lend aid in a proposed recovery process. Also, Seabed Explorations utilizes established scientific processes and methodology to authenticate provenance of the artifacts, the vessel and its possible destinations. Whenever and wherever possible, the historical, cultural and archeo-anthropological forensic value of the discovery is assessed before any further operation is set in motion, other than the establishment of security at a site if and when it is deemed necessary by collective decision of the appropriate authorities. Commercial excavation of wreck sites conducted by ethically fit and fastidiously minded companies like Seabed Explorations, is a proven method by which countries can reduce losses to Underwater Cultural Heritage. 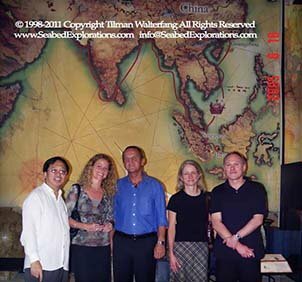 Having enjoyed the benefits of sufficient funding, qualified personnel and years of hands-on experience, Tilman Walterfang and his team can confidently conclude that they have the professional means and know-how to assist the governments and sovereign nations of the world in recovering lost treasures for forensic study and subsequent display. We are also active in educating local communities to prevent any willful or accidental damage to the worlds rich reserves of underwater cultural heritage. Seabed Explorations recognizes the magnificent cultural significance and often priceless scientific importance of its discoveries and strives to make them accessible to the world. We are committed to making our finds available for study by historians, archeologists, anthropologists and other academics, as well as for viewing by the general public in the leading museums of the world whenever and wherever possible. In the case of the relics recovered from the 9th century Tang Wreck off Sumatra in Indonesia, a deliberate decision was taken not to auction the cargo on a piece-by-piece basis (as was typical of the industry at the time), as this would have scattered over 60,000 artifacts across the world, thereby destroying the historical context of the cargo as a whole. The artifacts, have now been revealed to the world in an exhibition in the Art Science Museum in Singapore with the assistance of the Smithsonian Institution, and thanks to Tilman Walterfang’s ethical philosophy, it was kept intact as one entire collection, so that it could be studied in its original context. Tilman Walterfang kept the precious cargo in its own private conservation facilities for six years, where they were been painstakingly desalinated, studied and carefully conserved. Seabed Explorations pays meticulous attention to historical, archaeological and conservation procedures. The collection presently represents the single largest consignment of Tang Dynasty artifacts ever discovered in Asian waters and is now scheduled for a worldwide tour. It includes some of the oldest cobalt-blue-and-white ceramics made in China, several gold items made with Arabic designs and swastikas, jars filled with spices and incense resins, bronze mirrors, thousands of glazed bowls, ewers and other fine ceramics, with silver ingots. The pièce de résistance of the exhibition is a small cache of magnificent, intricately tooled vessels of silver and gold, which remain unparalleled in quality and design from the period. Many questions provoked by the find remain unanswered, such as, “Why they were carried by the ship and who was destined to receive them? 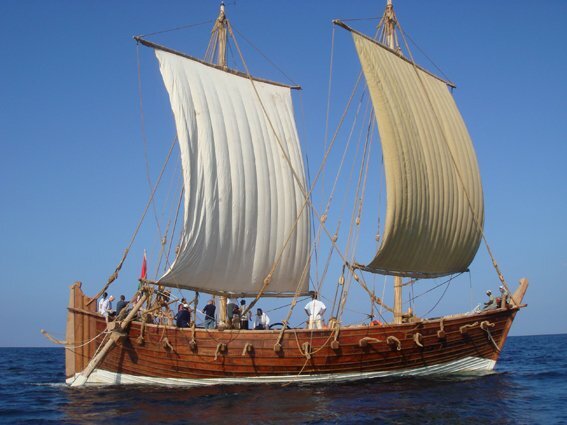 An accurate reproduction of the shipwreck known as an Arab dhow, and named The Jewel of Muscat, was recently presented by the Sultanate of Oman to the government and people of Singapore. The Jewel of Muscat was built as a joint effort by the governments of Oman and Singapore based on the research of Dr. Mike Flecker, who was employed by the Seabed Explorations during the recovery process. 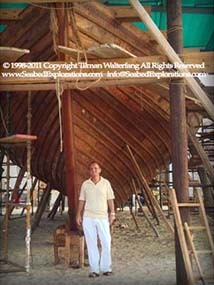 Tilman Walterfang, founder and owner of Seabed Explorations NZ Ltd. at the construction site of the Jewel of Muscat in Muscat. The Tang Dynasty cargo was eventually acquired by the Singapore Government with a mandate to support further research and conservation. The cargo was purchased for around 32 million USD by a private company, the Sentosa Leisure Management, and the Singaporean government in 2005, and loaned to the Singapore Tourism Board. Seabed Explorations recognizes the indispensable cultural and scientific importance of its discoveries and strives to make them accessible to the world. We are committed to making our finds available both for study by historians, archeo-anthropologists and other academics, as well as for viewing by the general public in leading museums whenever possible. In each instance with our Intan Shipwreck Collection, the Maranei Shipwreck Collection and the Tang [Belitung] Shipwreck Collection, a deliberate decision was taken to refrain from auctioning the cargo piece by piece. At all times the priority has been to maintain the integrity of the collections as a whole and all three collections have been conserved with a view towards installing them in well-appointed museums, thereby enhancing their strategic value. In this regard they represent an integral part of the cultural and diplomatic capital of the participating Nation-States. (Walterfang's left) During a commemorative ceremony in honor of Mr. Tan Sri Khoo Teck Pua, patron and founder of the The Koo Estate. in Mainz, supervised a team of conservators in New Zealand and Germany. 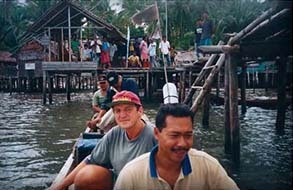 During the second season, archaeological work was supervised under direction of Dr. Michael Flecker, an experienced specialist in Southeast Asian underwater archaeology. Flecker was the operational amanger who directed the second season of the recovery operation, and he retrieved samples of organic materials—including samples from the hull — thus providing scientific documentation that eventually led scholars to understand that the Belitung wreck was the oldest Arab vessel discovered in Asian waters. Thus, in an increasingly uncertain economic environment, many institutions are now realizing the importance of correctly interpreting and creatively exploiting the strategic value of such collections: More specifically - Looking at the long-term financial advantage that comes from the careful development of a resource rather than an opportunistic ‘smash-and-grab’ approach. At the same time, we remain acutely aware of the durable positive branding on the world-scene that companies may now reap when they respect the ‘triple bottom line’ of economic, social and environmental accountability. When we consider carefully the strategic value of such finds, the dimensions of both financial prowess and cultural prestige begin to overlap handsomely. Seabed Explorations demonstrates that such strategic value comes not only from identifying a special resource such as an historically valuable shipwreck, but also from respecting the integrity of such a resource, while allowing all its stakeholders to benefit fairly from its utilization. It proves that utilizing such a resource is not at odds with the implementation of ethical standards - to the contrary, ethical and systematic practices actually promote long-term profits. In this regard all parties involved are privy to a win-win situation. 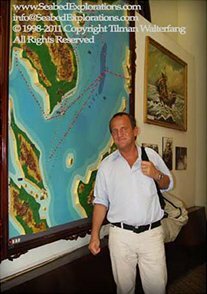 Tilman Walterfang, founder and owner of Seabed Explorations NZ Ltd. in Vietnam, at the Vung Tau Museum. 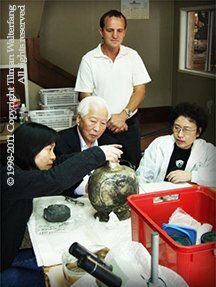 Tilman Walterfang, founder and owner of Seabed Explorations NZ Ltd. with Prof Geng Baochang, senior research fellow at the Palace Museum Beijing (fourth from viewer's left), together with archeologist Ms. Chen Yuh-shiow (Second from viewers left) during a visit to Seabed Explorations' Conservation facility. 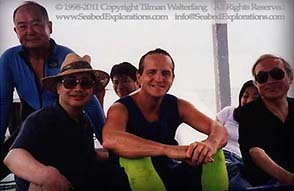 Ms. Chen Yuh-shiow, was employed by Seabed Explorations; Chen Yuh-shiow was referred by Prof. Ledderose at the Univ of Heidleberg. 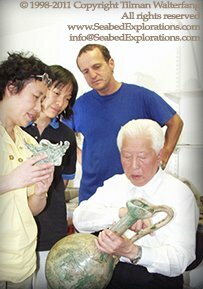 Prof Geng Baochang is the deputy director of Peking's Forbidden city and China's foremost expert on antique ceramics. in Mainz, and supervised teams of conservators in New Zealand for the cargos of the Maranei Shipwreck and Belitung [Tang Treasure] Shipwreck). 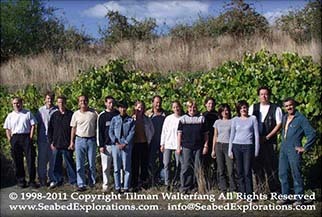 (C) 1998-2012 Copyright Tilman Walterfang - All rights reserved.